Romanian- American bass-baritone Alex Soare makes his Florida Grand Opera debut this season. He was recently seen as Dulcamara in Donizetti’s L’elisir d’amore with Opera Iowa, Don Alfonso in Mozart’s Così fan tutte with Candid Concert Opera, Gremin in Tchaikovsky’s Eugene Onegin and Escamillo in Bizet’s Carmen with the Aspen Music Festival, and Sprecher in Die Zauberflöte and Elisha Fitzgibbon/Legs Diamond in a world premiere workshop of Evan Mack’s Roscoe with Opera Saratoga. Alex has also been a member of the young artist programs of Des Moines Metro Opera and Nashville Opera. He began his undergraduate studies in Brasov, Romania, and continued at the Mozarteum in Salzburg, Austria, later earning a master’s degree in operatic literature and vocal performance from Northwestern University, where he was a recipient of the Joyce Reed Cope Scholarship. 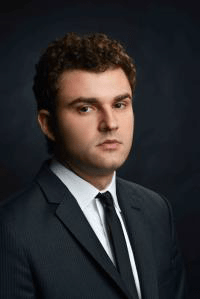 This season at FGO, Alex will sing Don Basilio in Rossini’s The Barber of Seville and SS Man #1 in Weinberg’s The Passenger, and will study-cover the title role in Donizetti’s Don Pasquale.